Yesterday I was writing about how the SPFL Premiership has been been a bit of an oddity this season. 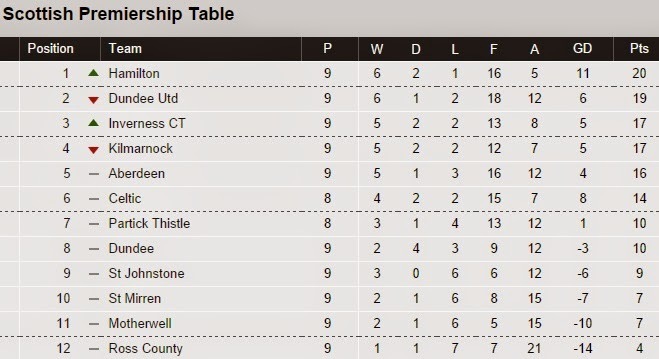 Celtic could have jumped up to third by winning today's home game against Hamilton. Maybe the drama of Hamilton's defeat of Hibs in the play-off matches has given them a momentum that survived the summer. Maybe it's just a flash in the pan. Hamilton won't win the league. But Celtic need to do more than just win their game in hand to get back to the top of the table. When Ronny Deila was given the Celtic job a lot of people asked "who is Ronny Deila?" It's a problem for him, not yet a fatal problem but an issue nonetheless, that we're into October and people are still looking at each other and asking "who is Ronny Deila?" Sixth in the table after eight games and no Champions League football (despite getting a couple of chances to make it). Thursday's Europa League win over Dinamo Zagreb was a bright spot. The continued rehabilitation of Craig Gordon to fill the gap left by Fraser Forster's departure is another. His is a team in transition. But being Celtic manager means making your mark on the team while still winning games. If you don't get the knack of that quickly you've got problems. Ask Tony Mowbray. And the weight of expectation and the evidence of history combine to make unusual defeats look more meaningful than they actually are. So this wasn't just a bad day at home to a useful Hamilton side. This was a first home defeat to this opposition since Neville Chamberlain was still trying to appease Hitler. It ends a run of home form that stretched to 34 games undefeated. Celtic's strength is usually to rise above the rest of the teams, a refusal to get embroiled in that aspect of the Premiership which means anyone can beat anyone else on any given day. To do that you need to be winning more than 50% of your games. He's won four from eight in the SPFL and seven from 17 in all competitions. That's not good enough. As I wrote yesterday, Celtic will win this league. The board should also show patience with Deila, they need to back their man. But the patience can't be endless. Spending much longer than a quarter of the season mucking about in mid table isn't acceptable. My personal view is of a manager still uncomfortable in a new role in a new country. I don't think he's handling the press particularly well and, Celtic fans might want to correct me, I don't sense a huge connection with the support. Sometimes managers, however good, just don't "fit" with certain clubs. Deila's not yet convinced me that he's not fallen victim to that situation. Any more results like today and he'll probably be feeling a lot less sanguine about his team and about his own position.